I love to travel. Partly, of course, it’s about exploring new places: the sights, the smells, the buzz of being somewhere different. But to borrow from a cliche the journey itself is at least as important as the destination. I like to travel slowly when I can: on foot, by train, by boat. Anything that will let me appreciate the landscapes that I’m passing through, that will give me a sense of distance and time. The moment above was captured by Leigh in the middle of our first big adventure as a family, and actually in the middle of a journey within a journey – one of many on that trip. We were in New York, and left our hotel in the meatpacking district in the morning with a vague idea that we would walk to the children’s museum in Brooklyn. It looked a fairly long way on the map, but we figured we weren’t in any rush. And a good thing too – in between getting lost and voluntarily taking scenic detours we were on our feet for about eight hours. Most of that time we weren’t anywhere particularly significant, but that really didn’t matter. We made it to the museum, giving Arthur a baby-friendly pitstop where he actually crawled for the first time. The rest of the time he was in the sling, sleeping or feeding or just looking around. It’s always hard with cities to know how to get the measure of them, but I’ve found that just wandering is a pretty good way to start. There’s a lesson for life in there somewhere too I reckon. Not to stay still for too long, to keep meandering, even if you feel aimless, because only then do you stand a chance of coming across the thing that will give you direction. To appreciate what you find along the way, too – not just focus blindly on your destination, on the things you think you’re going to find, because it’s often in the unexpected that the magic lies. 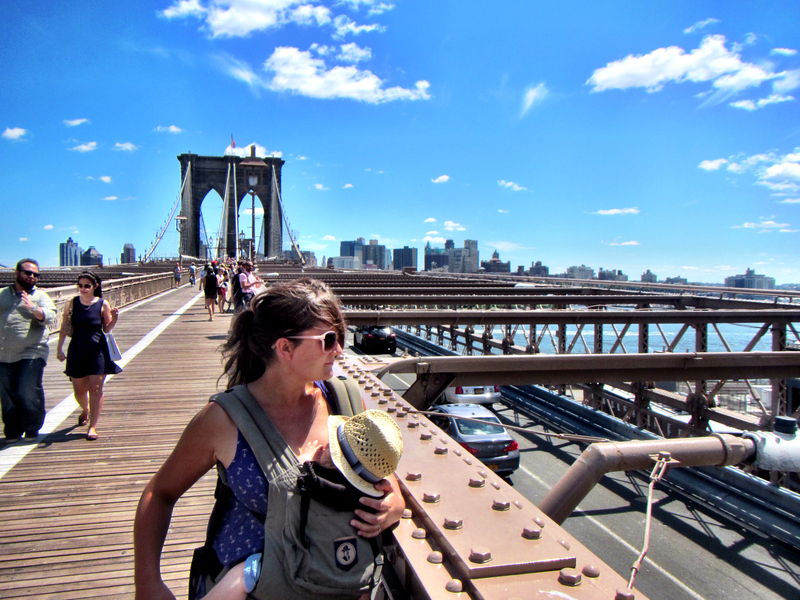 This entry was posted in Sophie is photographing, Sophie is travelling, Uncategorized and tagged Brooklyn, journey, New York, slow travel, travel, walking on July 17, 2014 by sophieblovett.